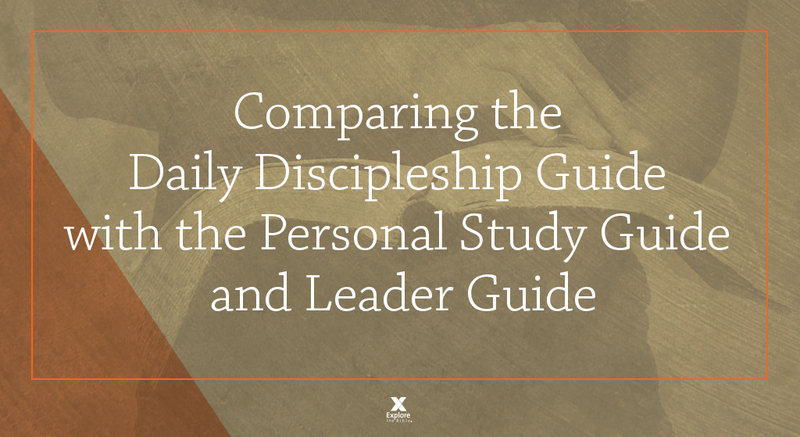 You may be wondering how the Daily Discipleship Guide compares to the Personal Study Guide and Leader Guide. Let’s start with the process used to create the resources. We begin by creating a set of outlines. We recruit the writers and provide them with the outlines. The fact that everyone is writing to the same outlines helps us coordinate the resources. The submitted files are then reviewed by members of the editorial team. These reviewed files are then supplied to two different teams. One team creates the Personal Study Guide and Leader Guide, while the other team creates the Daily Discipleship Guide. Both teams are free to edit as needed, but they also consult with each other to make sure the resources are consistent. Shared study plan: All the student and adult resources in the Explore the Bible family follow the same study plan. Shared content: Since both resource sets begin with the same reviewed writer files, they both reflect the same trusted content. Both are reviewed and compared for consistency. Key Doctrine: The Key Doctrine statements in all the adult Explore the Bible resources are quotes from the Baptist Faith and Message, which also serves as the guiding doctrinal statement for LifeWay. One statement is selected for each session for all the adult Explore the Bible resources. Work with support resources: The Adult Leader Pack, Adult Commentary, QuickSource, and Biblical Illustrator will be helpful for groups that use either approach. Bible Skill feature: The Bible Skill feature is clearly marked in the Personal Study Guide. In the Daily Discipleship Guide, the Bible Skill is included, but is used for daily Bible engagement or during the group time without being identified as the Bible Skill. Leader Commentary: In the Leader Guide, six pages of Bible commentary is provided, followed by group plans. In the Daily Discipleship Guide, selected Bible commentary is integrated into the group plans. Expectations: In the groups using the Personal Study Guide and Leader Guide, the expectation is that group members will study prior to the group time so they can more readily engage in group discussion. The expectation of group members using the Daily Discipleship Guide is that they will participate in the group time and then do additional study in response to what was done in the group time. One vs. two resources: The leader of a group using the Personal Study Guide needs a Leader Guide, which is a separate resource. In groups using the Daily Discipleship Guide, the leader uses the same guide. Both approaches have pros and cons. For example, some leaders like having additional content not included in the group members’ resource (meaning you need two books). However, that also means someone has to manage the purchase and distribution of two different resources when they could purchase the same thing for everyone in the form of the Daily Discipleship Guide. The decision about which one to use comes down to which advantage you value the most. 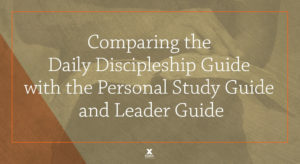 First of all, you may choose to direct some of your groups to use the Daily Discipleship Guide while other groups continue to use the Personal Study Guide/Leader Guide model. Since both would be studying the same passage, your groups can continue to be aligned. However, it would be best for each group to use a single approach within that group…providing half of a group with the Personal Study Guide and the other half with the Daily Discipleship Group will make it difficult for most teachers. Review both resources. You can secure free samples of the Personal Study Guide (click here) and the Daily Discipleship Guide (click here). Complete the form and you will receive the four free sessions to compare. List the pros and cons of each approach. Rank the pros and cons for each approach. Compare the two approaches based on the ranked pros and cons. Decide based on the comparison. What advantages do you see for a group using the Daily Discipleship Guide? For a group using the Personal Study Guide and Leader Guide? Which advantage is most important to you? Interested in Knowing More about the ideas behind the Daily Discipleship Guide? What is the Daily Discipleship Guide?